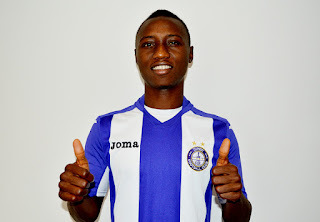 naijaleaguez.com.ng can reveal that Hungarian side, Ujpest, has unveiled their Nigerian acquisition, Obinna Nwobodo. Nwobodo played a significant role as Rangers won the Nigerian title last term but will now continue his development, in Hungary, after sealing a three-year deal. The former junior international promised to work hard to justify his presence in the team..
Újpest FC. I want to fight and fight my way forward to help this great team to win trophies. Developed by modest Enugu side, FC Inter, Nwobodo, becomes the second player, who won the league with Rangers to move to Europe after Chisom Egbuchulam. Ujpest are 20 times champions of Hungary.